The produce at this week's Farmer's Market jaunt was no less than stellar, which always is inspiring and yields terrific recipes at Scrumptious Street. While in Italy recently, I was reminded of the perfect affinity zucchini and mint have for one another so I made a wonderful summer dish of "Zucchini & Tomato Salad with Capers and Mint in a Yogurt Dressing". 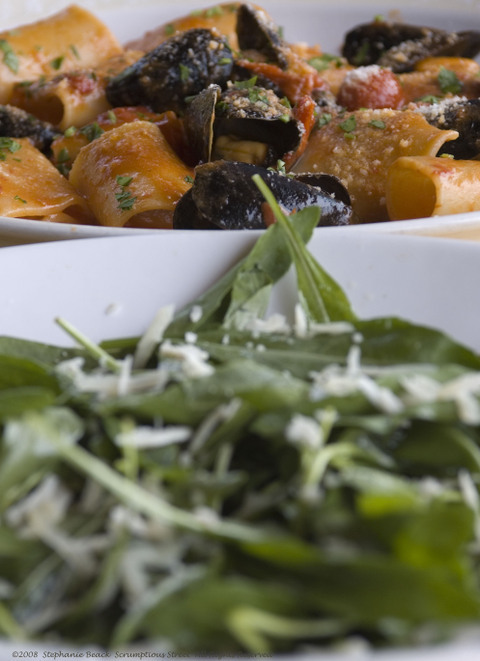 This isn't necessarily an Italian dish, but it is Mediterranean influenced. 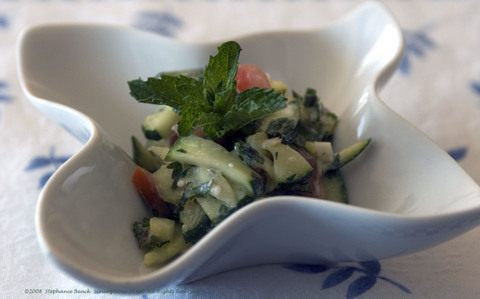 If you've never tried zucchini and mint, this is really a spectacular combination that must be tasted! Additionally, feta cheese is a beautiful supporting cast member here and lends just enough tangy creaminess to really make it special. The salad is incredibly simple and will be delicious if you follow a few guidelines. You must have very fresh produce as close to the farm or garden as possible -- these ingredients in particular, cannot be the watered-down grocery store varieties. Zucchini is somewhat bitter when raw. However, it's quite delicate so when cooked it would be too soft and dull colored for a salad. So, I kept it raw but prepared it by dusting with salt and letting it strain. Just like eggplant, this treatment draws out the bitterness in the skin and flesh of the squash, gets the juices flowing and tenderizes the vegetable. It softens a bit without changing the color or fresh lightly-crunched structure. So, make sure to follow the steps for salting and straining in this recipe and you'll love the salad too! 2 tsp. lemon juice, separated into two parts of 2 tsp. 1. Placed the sliced zucchini in a fine colander or fine-mesh sieve. Sprinkle with kosher salt, toss thoroughly and let stand in the sink to strain for 10 minutes, tossing every couple of minutes. After 10 minutes, rinse the zucchini thoroughly, getting off any remaining salt. Take a few paper towels and place the zucchini in the towels and gently squeeze out any remaining liquid. 2. Chop your tomato in half and scoop out the seeds with a grapefruit spoon or your fingers. Dice the tomato. In a bowl, combine the zucchini, scallions, seeded tomato, capers, parsley, feta, mint, lemon zest and 1 tsp. of the lemon juice. Toss gently to combine. 3. In a small bowl, make the dressing by combining yogurt, the remaining 1 tsp. lemon juice, white pepper and olive oil. Whisk and slowly add the olive oil, the quantity you use will depend on the thickness you want and the texture of the yogurt you used. 4. Pour the dressing over the salad and toss gently. Refrigerate for 4 hours and then serve chilled. Hope you like this refreshing, light and healthy summer salad. Shame on me, I've been PLAYING! I know, it's disgraceful that I haven't posted in more than a month. That has never been the case since I started this blog more than two years ago. However, while my apology to you readers is sincere I must tell you that I'm quite thrilled and rested after this break. You see, I've been....playing! And traveling! And in general having a really wonderful month focusing on quality live-human-time and no online-social-time and it's been wonderful! Where have I been? Oregon, Italy, Idaho, Montana...for the main highlights. No, I didn't take a lot of food photographs and compile recipes for this blog. It really has been a break. But, now I'm back and ready to show you the one place, the one amazing experience that was SO good that I did capture images. 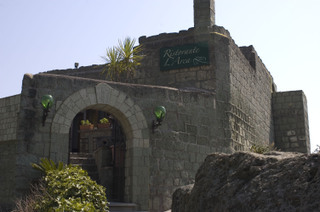 Scrumptious Readers, meet Ristorante L'Arca. 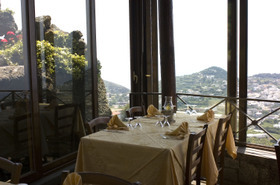 An absolutely beautiful, quaint and breathtaking restaurant nestled in the volcanic rock mountainside of Ischia, Italy. As you can see, the setting was incredible. But, the food.... oh, Mamma Mia, the food was exquisite. We started off with this trio of bruschetta. Perfectly grilled bread lightly kissed with garlic and olive oil then draped with the richest, ripest tomatoes dressed in fresh pressed extra virgin olive oil, baby onions and fresh basil. Or, with fresh buffalo mozzarella added in and the third, with fresh and tender cannellini beans. The beans were absolute perfection. Not from a can, but from a pod and then dried. Not soggy but cooked through yet still with structure. Actually, the beans were al dente, just like every good Italian cook makes his or her pasta. 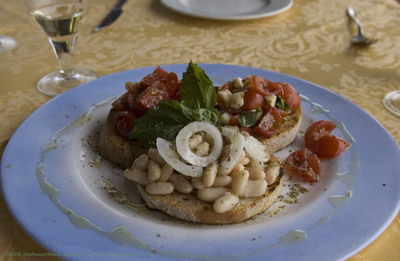 When taking a bite of the bean bruschetta, the textures melded into a balanced bite of creamy and crunchy, tender and solid with a rich and nutty garlic flavor and grassy olive oil finish. It was the best bruschetta I've had. Ever. 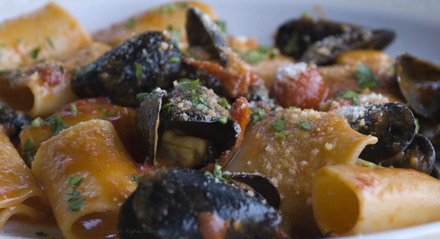 Mr. Scrumptious won the Best Entree award, with his superbly executed meal of fresh hand-made pasta with mussels. ALL OF IT was fresh. Every component was at the peak of ripeness, freshness, and thus maximum flavor! The tomato sauce was nothing other than the ripest tomato, gentlest garlic and onion and green-spicy olive oil. The sauce was simple yet perfect and the mussels were plump, juicy, smelling and tasting of the sea from whence they came that same morning. Nothing was shipped across country, across continent, across the world. Every ingredient came from that tiny little island in the Mediterranean Sea, off the coast of Naples. It was a perfect meal and only after we ordered did it occur to us that we'd missed the local specialty; rabbit. We called over the waiter and asked him about it even though it was too late, we'd already committed to our other dishes. In response to our question, "How's the rabbit? ", we got the perfect and typical Italian waiter response: "In my opinion, it is the best rabbit (in Italy? In the world?). It is my mother's." Next time, we'll try it.